Posted 4/15/2019 5:59pm by Core Committee. Are you as sick of roasted root vegetables as I am? 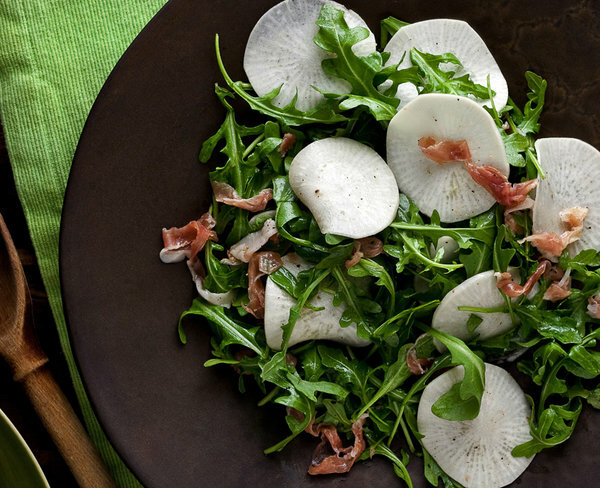 Warmer days means cooler meals, so why not toss those turnips into a salad? This recipe calls for arugula but we can mix in some other CSA greens too. We're looking forward to another share of farm fresh vegetables! There are only 3 pickups left in the winter season, so don't forget to sign up for your volunteer shift if you haven't completed one yet. Sign up here. Also a reminder that the next pick up on May 7 will be at a different location, Sixth Street Community Center (638 E 6th St, between Aves B & C). Summer/Fall Share 2019 - Two Weeks Left to Register! Distribution will be once a week, beginning in June and running until late October or early November. We expect to continue with Tuesday evening pick-ups from 4pm-8pm in our same location at St. Mark's Church on the Bowery. The cost of the Summer/Fall 2019 share is is $450.00, and payment is due by 4/28. For more information about our policies, including summer work shift requirements, please view our Summer 2019 Member Agreement. Just a couple of short weeks in to the Brooklyn Public Library’s brand new seed library program, which opened for business on March 13, it ran out of seeds. “Once the awareness got out there, it was not too hard to give them away,” says Jesse Montero, director of the Central Library branch at Grand Army Plaza, indulging in understatement. Hundreds of packets of tomatoes, peppers, eggplants, flowers, herbs were quickly snatched up by garden-happy Brooklynites eager to get planting—in their apartments, in the tree beds on their blocks, and in shared community plots. Seed libraries are a growing phenomenon across the country, a natural pairing, according to Montero, between locals and the actual physical public libraries that serve them. Seeds are “literally the seeds of other things that can happen: creating a sense of community through the joint endeavor of a garden, supporting health and nutrition through the growing of produce locally, beautifying neighborhoods and making them safer and more livable places,” Montero says.